EMINENCE has a owner's suite on the main deck plus six guest cabins which are located on main and lower decks. 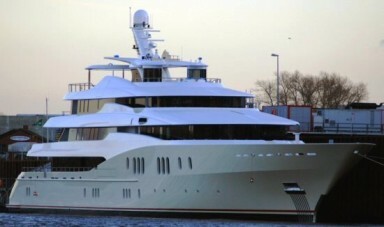 Abeking & Rasmussen, a famous German shipyard located on the banks of the river Weser, launched its largest superyacht ever M/Y EMINENCE with a 257 ft. (78,43 m) length over all and a beam of 40,7 ft. (12,40 m). The luxury yacht’s exterior as well as interior design was created by Reymond & Langton Design. The naval architecture was completed by A&R’s in house engineering department. Luxury motor yacht EMINENCE was originally ordered by a US owner who owns another well known Abeking & Rasmussen motor yacht called Excellence III. However during the final months of completion, her owner sold the yacht then called Excellence IV and she was launched as EMINENCE in mid March 2008. EMINENCE has an extremely fine destroyer like bow entry. This provides low resistance to waves and excellent seaworthiness as well as an impressive 6.000 n mile range. The five deck luxury motor yacht has a steel hull with aluminium superstructure. She also features an a very large transom hatch with two of the well proven tender launching systems developed by A&R which allow smooth launching and recovering even when under way. The superyacht’s draft has been reduced to 10,5 ft. (3,2 m) which will enable access to shallow anchorages and bays such as those found in the Bahamas. EMINENCE is propelled by two 1492 kW Caterpillar main engines which give a very respectable speed of 16.5 knots. The yacht has been built according to Lloyds Register of Shipping and MCA standards. Her original repeat owner ordered an extremely large private suite area which is situated on the forward upper deck and includes an office and a library. She also boasts a huge galley situated for fast and easy access to the al fresco dining area with sliding doors further aft on the same deck. The yacht offers a cinema a Spa Pool and a sauna. The six guest cabins are located on main and lower decks. The crew on lower deck will get a number of normally rare single cabins and two spacious mess areas. The luxur yacht offers a cinema a Spa Pool and a sauna. She also features an a very large transom hatch with two of the well proven tender launching systems developed by A&R which allow smooth launching and recovering even when under way. Comprehensive list of water toys, communication and electronics.